My basic vocation came from my parents who inculcated virtues and the value of prayer. We began each morning with Morning Prayer and closed the day with recitation of the Rosary. There was no television. Mother would go to Church library and borrowed books to read to us. I went into the greatest struggle of my life when the moment to tell my family that I wanted to join the convent arrived. I loved my family very much and was torn in two – the pain of separation from my beloved family and to become a missionary. In my pain and desperation, I turned to our Blessed Mother Mary. I surrendered to her and asked for the grace to let go – which I was granted. In September 1951, I joined the Missionary Centre at Vimercate, Italy. During my religious training I felt affirmed. I made my simple vows on the Solemnity of the Sacred Heart of Jesus, 1954. By the end of 1954, I left Italy and arrived in Singapore on 24 December. When I landed in this hot, humid country, I began to miss the snow back home. The journey was challenging as I had no knowledge of the English language and meeting people on board the ship was a struggle. I began to learn the language through the daily interaction. One of the Sisters in the community taught me daily how to read the language – after which I was sent to a Secondary School to study the language. From Singapore I went to Kluang, Malaysia where Sr Louisa Sadorin continued to teach me the language as I still not able to converse well in English. There I was sent to the villages with Sr Elvira, who was a midwife. 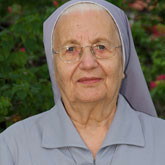 Sr Elvira would deliver the babies and I would baptize them and any others who wish to be Catholic. After a year, I was transferred to a new community at Jinjang. There, together with Sr Elizabeth Yeo, we went to visit the lepers sewing. As I was a certified sewing teacher, I was requested to teach the lepers sewing. Sr Elizabeth would translate my sewing notes from Italian to English. My health the began to take its toll – as there was nothing much to east except rice and a piece of small fish. Once a week, a Sister from Kuala Lumpur would send us cooked chicken. Due to my ill health, the Provintial transferred me back to Singapore – St Anthony’s Convent, Middle Road. Here I assisted Sr Margarita with the Sewing Centre. I was asked eventually to run the Centre and visited various schools to get orders for their school uniform and stopped the work that the girls were doing – sewing embroidery – which was time consuming with little income. Daily I travelled between these two Centres, also praying and sharing with them some spiritual thoughts. When the girls moved over to Aljunied, I began to collect more jobs – made uniforms fro Chartered Industries, Phillip, and other factories, shopping centres, e.g. C K Tangs, Metro. We still continues to sew uniforms for CHIJ, Holy Innocent, our schools and kindergartens. Soon, there was a need to expand the School, and our Centre moved to the ex-Our Lady of Lourdes School at Ophir Road. Besides sewing, the girls were encouraged to attend the BEST and WISE programme. These programme would help them to obtain GCE ‘N’ Levels. When we moved over to Ophir Road, we occupied the whole floor, and began to accept students who were unable to succeed in the normal schools. Here, with Sr Pricilla we expanded the programme with other life skills e.g. home economics and computer. Our students had good results year after year. In 1970, I organized a group of ladies, about 35, to help with the Church of St Stephen. These ladies, Christian Mothers, would arrange flowers and other sacristy work. Once a year I would organize an outing with some spiritual inputs. I would also invite various priests, even our present Archbishop Nicholas Chia, to give talks to the girls at the Sewing Centre. Through these encounters I came to know them better and the members began to bond with each other as well. I continue to assist with the present Sewing Centre, the ladies at San Zeno, our little thrift shop at the Canossaville Children’s Home whenever required and once a month meet up with the Christian Mothers. I thank God for all the graces I have received.